The following guidelines have been developed to provide advice on how to prevent further spread of flatworms. Please see the Most Unwanted section of this website for more information on flatworms and the threat they pose to Ireland’s biodiversity and economy. Inspect your site for flatworms – Check regularly under matting or pots standing directly on the ground for flatworms or their egg capsules. Flatworms are found on the soil surface; they will seek damp places, such as under loose turfs, plastic or other sheeting, rocks, flat stones, plant containers etc. for shelter during the day. Egg capsules can also be found in such areas. Where containers stand on black polythene or capillary matting, frequently check, where possible, the underside of the polythene or matting for flatworms. Whenever pots are standing directly on the ground, check whether flatworms have hidden under the pot and are either still on the ground surface or have adhered to the underside of the pot. Check your product for flatworms – Lift plants from their pots frequently to check for the presence of flatworms or their egg capsules. Flatworms and their egg capsules can also be found inside plant containers between the root ball and the edge of the container. Set traps – One of the locations where flatworms are most frequently found is in private gardens. Where nursery or other premises are adjacent to private gardens, set ‘traps’ close to the boundary, consisting of a weighted down sheet of black plastic or plank of wood. Check the underside of these traps frequently for the presence of flatworms or their egg capsules. Prevent spread – Inspect all outgoing consignments of plants carefullywhether or not they are for export. Check planting material leaving thenursery or other premises carefully for the presence of flatwormswhether or not it is for export. Maintain good hygiene – Always use fresh, sterile compost or other sterile growing medium when potting up plants, not material taken from places where flatworms might be hiding. 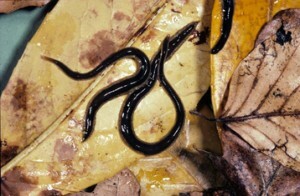 For example, a container of compost or growing medium which has been opened and left lying on the ground may prove an attractive hiding place for flatworms. Clear up spilt compost or other growing medium, disposing of or thoroughly cleaning used pots and other containers. Report sightings – If you suspect that you have found a flatworm or their egg capsule, please report your sightings through the Invasive Species Ireland website (https://invasivespeciesireland.com/report-sighting).